LOS ANGELES, Calif. — Electronic artist The G-Man and country keyboard player Doug Colosio announce the formation of Golosio Publishing (www.golosio.com), a music licensing company which will supply songs for film, TV, games and commercials. Colosio has been playing keyboards with country legend Merle Haggard for the past seven years and has songwriting credits on some of Haggard’s recent albums. “With six dozen new production music tracks and well over a hundred songs, we’re ready to create any type of sound you can imagine,” states Scott G, who is also the recording artist known as The G-Man. The G-Man points out that “You have heard my music whether you know it or not, because it has been on lots of commercials.” His six albums on Delvian Records are played in clubs as well as on college and Internet radio around the world. 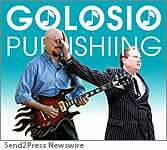 Songs by other writers and artists are also in the Golosio catalog, including roots and Texas swing from Scott Joss (now also with Merle Haggard and formerly in Dwight Yoakam’s band), rock from James Sotelo, urban tracks by Funk Foundation, and trance tracks by Holland’s DJ Insane. For more information, to license songs and production music tracks, or to commission original music, visit www.golosio.com or call 818-223-8486.